Editor’s note: Earlier this spring, a group of Concordia Seminary, St. Louis, students had the opportunity to meet Garrison Keillor (far right) while he was in St. Louis for his long-standing radio show, A Prairie Home Companion. Ashley Effken (on right, in front of Keillor), a 1st-year M.A. student in the seminary’s deaconess program, and Sol Grosskopf (left, in bowtie), a 2nd-year M.Div. student, provide this report. On Saturday, April 30th, several Concordia Seminary, St. Louis, students got to meet Garrison Keillor and attend the recording of his radio show, A Prairie Home Companion. Mr. Keillor’s radio show was performing live at the Fabulous Fox Theatre in St. Louis. During the afternoon, several seminarians got to watch the rehearsals of A Prairie Home Companion before the show went live. About a dozen of those who attended the rehearsal also had tickets to the live broadcast and were privileged to meet Mr. Keillor following the show. Among of the highlights of the program were the guest performers, which included jazz musician Erin Bode (sister of the Concordia Seminary’s own Prof. Gerry Bode), who performed several songs including “Be Still My Soul” (LSB 752) which she dedicated to the recent tornado victims. 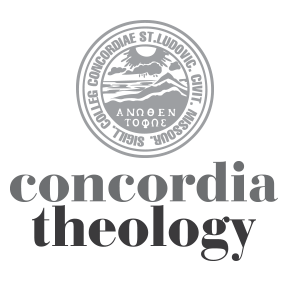 Throughout the show Lutherans, Lutheran women, and Concordia Seminary itself were mentioned several times. Overall, it was a unique and interesting opportunity to talk to someone who has presented our Lutheran beliefs and culture throughout the United States. For those in training to be tellers of the world’s greatest story, it was a great pleasure to talk with and meet one of America’s most well-known story tellers.